590517 Rotring Vellum Ink Cartridge Sold by the box of 3. Minimum order 10 boxes. 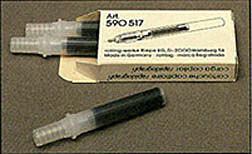 596517 Rotring Film Ink Cartridge Sold by the box of 3. Minimum order 10 boxes.